Sweet Romance Reads: Happy New Release Coming & Goodreads Giveaway ~ Be sure to sign up! Happy New Release Coming & Goodreads Giveaway ~ Be sure to sign up! Authors will tell you that releasing a new novel is both exciting and terrifying. In this case, I’m especially excited because I love this story. I grew up as that good, obedient daughter who wanted to please her parents and teachers, and also as a late bloomer—a girl who was smart in school, but never in sync with her peers. One basic truth of growing up is that a person who doesn’t have a sense of who they are, their own worth, even if their self-knowledge is imperfect, are prime pickings for those who victimize. 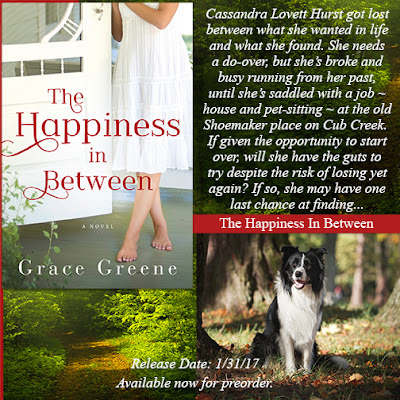 THE HAPPINESS IN BETWEEN, via the main character, Sandra Hurst, tells the story of how some take longer than others to figure out their future and sometimes need a few extra chances, and that confidence isn’t something that comes naturally to everyone. It takes hope and courage to face your life and make (or remake) your future. I hope you’ll read THE HAPPINESS IN BETWEEN and enjoy it. If you don’t already subscribe to our Sweet Romance Reads newsletter, please do so. The signup box is on the right-hand side of this page. Thanks! Grace Greene is an award-winning and USA Today bestselling author of women’s fiction and contemporary romance set in the rolling hills and forests of her native Virginia (Kincaid’s Hope, Cub Creek) and the breezy beaches of Emerald Isle, North Carolina (Beach Rental, Beach Winds). Her debut novel, Beach Rental, and the sequel, Beach Winds, were both Top Picks by RT Book Reviews magazine. She is the author of The Happiness in Between (release date: January 31, 2017), a standalone also set in Cub Creek. For more about the author and her books, visit www.gracegreene.com or connect with her on Twitter at @Grace_Greene and on Facebook at www.facebook.com/GraceGreeneBooks. Best wishes on your newest release, Grace! And available on audio, too. Sounds like a great read. Thank you, Josie! It's all very exciting. I hope others will enjoy the book, too. Congratulations on the release of your new book. It sounds intriguing. Best of luck for many sales. Thanks, Denise. I think the publisher did a great job on it.